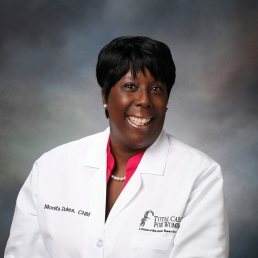 Monifa received her Bachelors of Science degree in nursing from Norfolk State University in Norfolk, VA. She later earned her Master of Science in Nurse Midwifery from Frontier Nursing University in Hyden, KY. In addition she has 13 years of experience as a Labor and Delivery and Mother Baby nurse. Monifa provides a variety of healthcare services to women of all ages including well women exams, teen health, contraception, menopause, prenatal care and post partum care.